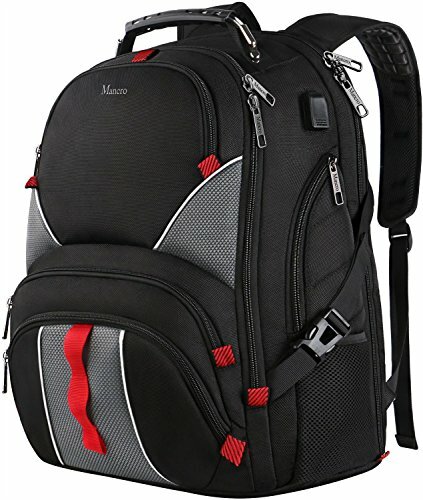 50L Extra large capacity design meets your maximum need of carrying all your goods to school, work, travel, hike . ✔TSA Friendly: Scan Smart lay-flat technology can simply unfold to 90-180 degree at airport security,protects your 17" laptop/notebook well,also ensures a Convenient and Quick TSA scan. ✔Anti Theft: Lockable Dual-access zippers design allows for easy access and increases safety(Combination Lock is NOT included).Back side hidden pockets secure your wallet,smart phone and other items away from thief,also offers a private space. ✔Convenient: With USB charging port and headphone port offer a quick access without opening up the backpack. A back side luggage strap could hang on the luggage/suitcases, gives you a convenient way to carry the backpack. ✔Comfortable:The back side and shoulder straps have excellent thick breathable airflow mesh padding, offering you maximum comfort for your back. -3 Front Compartment: With a organized accessories pockets for iPhone, pen, keys, cards, tissue, glasses and other small items. -2 Side Zipper Pockets: Sturdy Metal Zipper Pockets fit umbrella and other items. -2 Side Elastic Net Pockets: Durable Elasticized Mesh Pockets on both sides, fit water bottles. -Back Side Anti-Theft Pockets: For wallet, purse, passport, smart phone and other valuables.